I finally made it to the gym one night after work which is a miracle in itself. For some reason I just can’t find the energy to keep me going after a long day but I finally think I may be getting some of it back. I am not going to lie and say I was not completely exhausted after getting up at 4a.m., working 10.5 hours chasing kids outside all day, then making dinner, and everything else in between, before making a trip to the gym Tuesday night. Truthfully, I was pretty thankful we live so close to our gym because driving home a good distance would have been a chore. However, I made it, I had a great workout, and I was proud. Sunday: gym: 30 minute elliptical, rowing and legs, and 12 ab crunches!!!! ****A week go I attempted a crunch and had immediate pain. Today I did 12 before I had pain. This, to me, is quite depressing since before surgery I used to do 200 a day. My husband on the other hand, says I should be happy with 12 since a week ago I could not even do one. I guess he’s right, but for anyone who exercises to the extent I do, this is still depressing. Wednesday: 100 crunches…wow I am really making progress on these baby! As for our weekend………OMG where do I start. It is finally going to be gorgeous here in WI and I plan to take full advantage of it. I could wash vehicles, hang bedding outside, clean up our outdoor play toys, go hiking, maybe……..just maybe consider a small paddle in our kayaks, disc golf, geocache or simply just sit on the porch and enjoy the warmth and sunshine. So many choices that I have no idea how I will choose. Have you ever had open abdominal surgery? If so, how long did it take you to get back to doing abdominal workouts? How do you choose what fun activity to do first when the weather warms up in Spring? With temps in the high 80’s Saturday and humidity levels up there I decided it was time to get some things done around the house this weekend. I was feeling very Martha Stewart like for some reason. My husband tried really hard to get me to go fishing and wade through the river with him but I refused. I know from past experience that this river has snakes along the edge and I am NOT getting stuck in a river with no way of running for my life to escape these slithery reptiles. He was on his own and so was I, which sometimes is pretty nice. 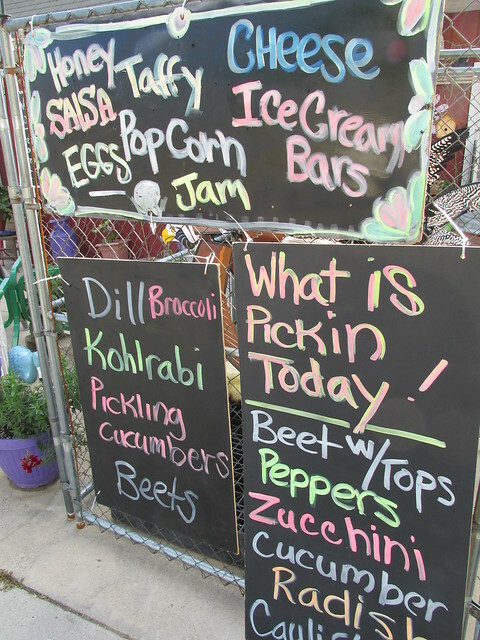 First, I made a trip to my favorite farmers market for some veggies. 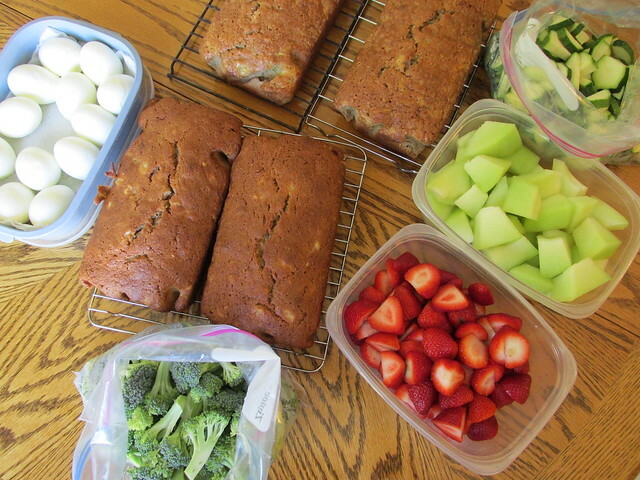 After that I came home threw in the laundry and started cooking and preparing things for the week ahead. 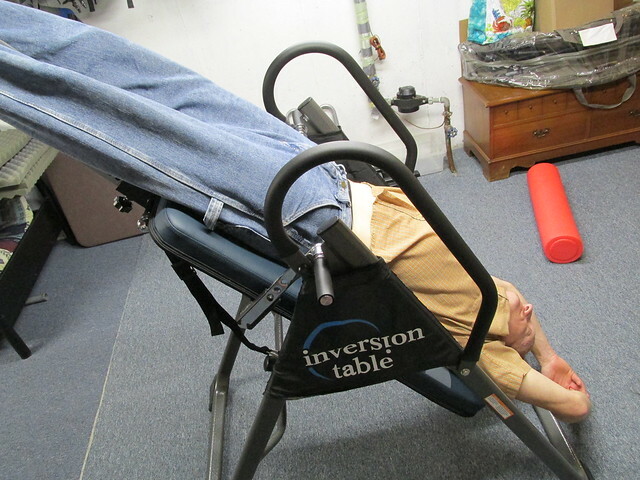 I then rearrange my workout area to make room for my husbands new inversion table. He was taking up space in my yoga area so we needed to fix this asap. Then I cleaned the entire house before it was time to make a nice dinner to be eaten alone. I decided lemon, dill, shrimp fettuccine sounded fabulous with sauteed zukes and onion from the market. Yummmmmm! After that it was a 3 mile walk in the heat of summer. I love summer, the hotter the better. Sunday brought another hot, humid day. 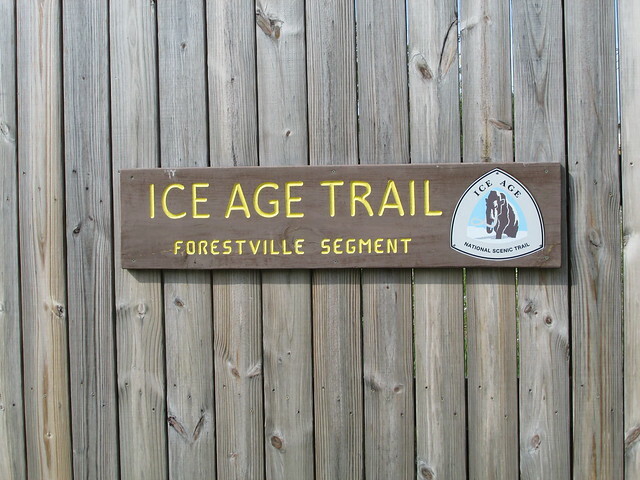 Although, that did not stop us from hiking 5 miles down the Ahnapee State Trail also know as the Ice Age Trail. We began todays hike at HWY 42 and Cty Rd H. There is a very nice parking area with the cleanest public bathrooms I have ever seen in WI. The trail in this area is completely flat, crushed rock. We saw no other hikers but we did come across a few bikers. It was pretty warm and buggy but still felt great to be on a trail again. 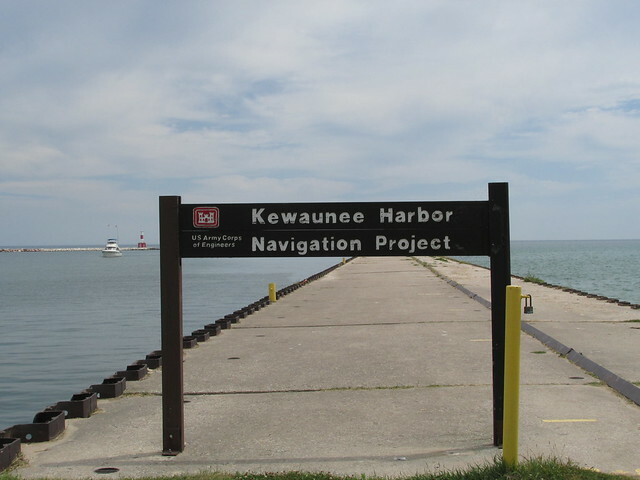 After our hike we made our way down the road a ways to Kewaunee, WI for ice cream and a cool walk down the pier. Then it was time to head home for the day. It turned out to be a great weekend. 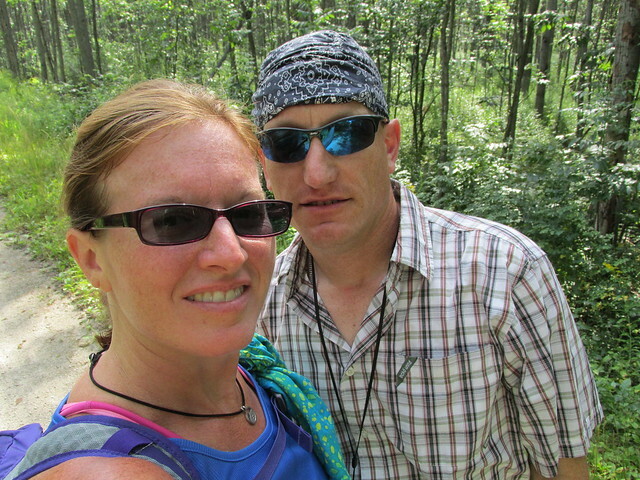 The sun was shining, my husband did his fishing, I did my cooking/relaxing/cleaning, and we hiked a good hike in the heat preparing for our upcoming trip. It’s almost been a year since we took one of my daycare children on her first hike. She had always asked to join us but when a child is included hikes need to be geared toward their abilities and interests. At the time she was almost 2 1/2 so we knew this would not be a day to hike many miles, climb bluffs, or explore anything too difficult. That being said, this did not mean we could not all have fun being outdoors. She was excited, which in turn made us excited, and the key to everything was to make her feel like one of us. We had backpacks, so she needed a backpack, we had water bottles so she needed a water bottle, and so on. Well, to this day I still hear stories about that hike from this child. She remembers everything from the items she found in the geocache bucket to the cookies we ate on the trail when we found the woolly bear caterpillar. It’s amazing and so rewarding to hear that she had so much fun at such a young age being outdoors. Which brings us to now, a year older. She has been asking lately if we are going to ever go hiking again and I keep telling her as soon as the snow melts we will. However, this year she has a much larger request for her dream hike. She has this hope to hike into a cave. (And she has no idea that her childcare provider dislikes bats) Not just look at the opening of a cave, nooooo, she wants to hike INTO it. She is going to bring her headlamp that we bought her for her birthday and go explore in this cave. She tells me it will all be fine, that we can hold hands and then we won’t be scared. How nice of her to offer to hold my hand. So, me being who I am, I have started researching caves nearby. I can only hope at this point that she chickens out at the cave opening when she she’s it, but if not, I may just try and convince her that my husband is a better cave explorer that I am and send her in with him. I will keep you all updated on this cave hike when it happens. Keep it simple, age appropriate, let them have input on the adventure and make it fun. You will be amazed how much fun you will all have. For me there is nothing better than seeing families together enjoying the great outdoors. A Chilly Last Splash Of Summer…What’s Next? Fall arrived this week which is why we now have all our kayaks stored for the winter. That is not to stay our gear could not make another appearance this fall, however it is very unlikely. We were able to get to the river one last time this past weekend as a family. It was also our son’s first time on whitewater with his new kayak. The river was running higher than usual and it was quite a ride for us all. After being laid up recovering most of the summer this was a fantastic way to end the paddling season for him. We now move on to camping, geocaching, and hiking. This is the best time for these activities in our area. There is not a lot of mud and water from melting snow like spring time brings. No knee high snow to walk through like during the winter months and not many bug, snakes, or heat/humidity to have to endure from the summer months. Believe me, our calendar is packed right up until Thanksgiving with anything I can possibly think of to do outside. and living life just as I plan, like this. I better be going, have a great weekend everyone. Copper Falls State Park is where our summer vacation began. 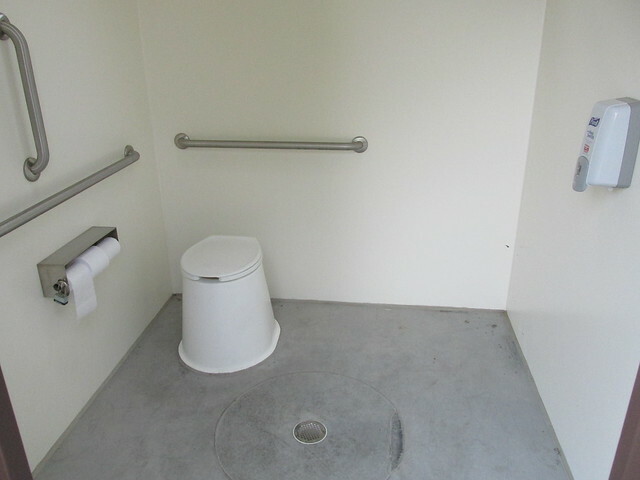 It is located in Mellen, WI. Upon arriving we were surprised to see they offered carts to help with hauling our supplies to our hike in campsite (August goal # 1). This was nice and very helpful. We arrived mid morning and got all settled into our site before changing into our hiking boots and hitting the first trail on our agenda. Typically, I do quite a bit of research before taking any hiking trip just to see what others have had to say. I knew the trail was 1.7 miles long and a loop. 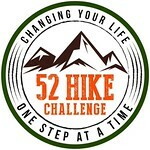 From the reviews I read, I was expecting a much more strenuous hike than it was. This turned out to be a very easy walk, with a few steps to climb, and the entire trail is crushed rock which made for a nice stroll along the Bad River. 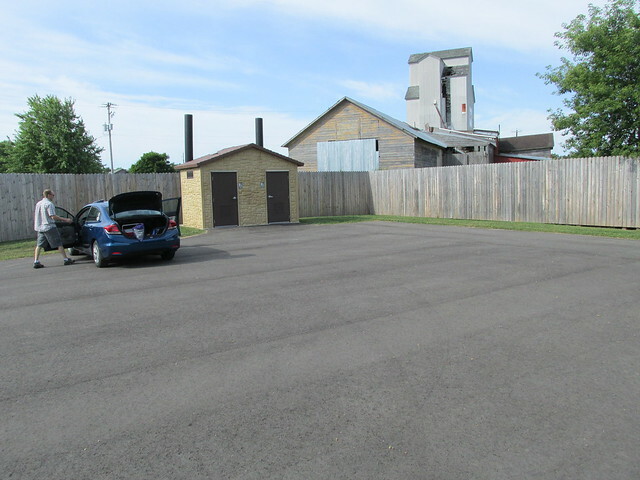 The trail started behind the concession stand which is easily located upon entering the park and picking up a park map. If you venture off to the observation tower (you will see a sign pointing to it on the Doughboy Trail) you will encounter many more steps. We did venture off to the tower and were very disappointed because the trees have grown almost taller then the tower and the view was literally the tree tops. Not worth the climb in my opinion. On the Doughboy Trail you follow the Bad River and Tyler Forks seeing some amazing waterfalls throughout the entire gorge. Make sure you bring your camera!!!! After finishing the Doughboy Trail you can treat yourself to an ice cream cone in the concession stand which is also where this trail ends. Our next trail in this park we really wanted to see was the Red Granite Falls Trail. This trail was a 2.5 mile loop which brought you through a hardwood forest to the Red Granite Waterfall. We encountered four people on this trail the entire time. Much less populated than the Doughboy Trail. The water fall was beautiful and we climbed onto a big rock and sat and enjoyed the scenery for some time. We also were able to find a few geocaches in this park. A little side note for anyone geocaching, GPS satellites are very inaccurate in this area. Good Luck! Then it was time to call it a day for us. We made our way back to our campsite, made a wonderful freeze dried meal, and then headed to the shower house before crawling into our tent and sleeping under the stars. We had a big day planned for our second day of hiking. After a week of poison ivy, an achilles tendon injury and the end of the week with my husband coming down with this nasty virus, it’s amazing we even got out this weekend and did anything. Although, we are troopers and I just can’t stay indoors when the sun is shining. So Friday night we cancelled our original plans of kayaking and changed to hiking and a fishing trip. Kayaking takes much more stamina and my husband just did not have it in him with what he was fighting off. Saturday morning we packed up the gear we would need to visit a new state park and do a little hiking and maybe some fishing. We headed to Newport State Park in Ellison Bay, WI. We arrived mid morning after a few stops in Door County and were surprised to see how quiet this park was. They have 16 total campsites and every single one is a hike in site which probably explains why the park was so quiet. We grabbed our fishing poles and took a trail that lead to Europe Lake. This was where we were hoping to fish but upon reaching the lake access from the trail was difficult at best. Plus the lake was so shallow on the edges that we would have had to walk in to reach deeper water to fish. 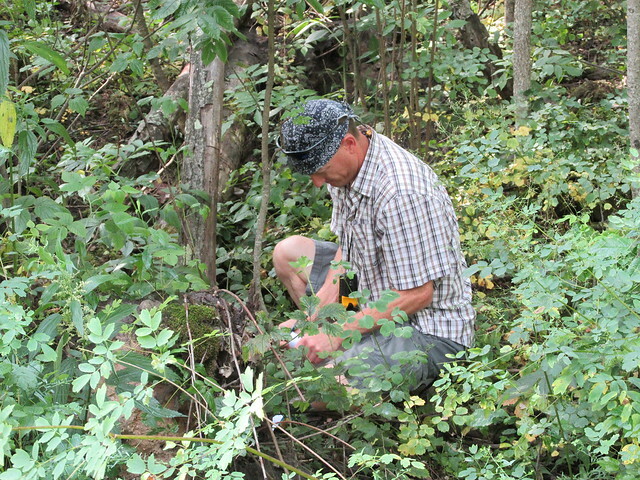 Although fishing was not possible we did continue hiking the trail to find a few geocaches. My husband and I also wanted to check out three camp sites we were interested in. All three were beautiful but we have our heart set on camping at either 14 or 15 in the near future. 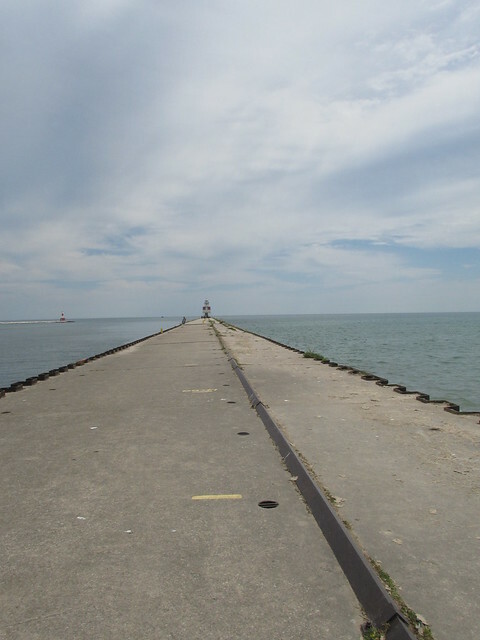 It is miles from any other site, feet from the lake, and is very secluded. Just what I like on my weekends. I am very impressed that the park service provides a steel lock box at every single site in this park because of animal problems with food a night. As we ended the trail we made our way to the lake shore and followed that back to our car. It was so gorgeous. After about 4 miles and a full day of fun I drove home so my hubby could relax and rest. He had had enough and was tired. This is a sign that he was pretty sick. Normally we can keep up with each other pretty well but after the day he was just out of pep. I was just happy to have hardly no pain in my foot by the time we were done. Sunday brought a sunny start to his Father’s Day morning. Although we knew rain was headed our way both my husband and son loaded their gear into the boat and headed out for a day of fishing together. I decided to stay home, catch up on errands, grocery shopping, and have some alone mom time. I know they did not mind going without me and I did not mind staying home alone at all. It all worked out quite well. They arrived home later in the afternoon and again my husband was quite tired. So it was a night of rest and relaxation. Do you want to see instant energy? Well, I had it all weekend thanks to good ole Mother Nature. Saturday I started my day with a workout at the gym bright and early. The alarm went off at 4am so my husband and brother could go out on the bay for some fishing for the first time this year. They had great success but I have no pics to share. If I would have sent the camera I would be pretty certain I would not get it back. (My husband is known to drop things in water fairly often.) So anyways, I figured it was the perfect opportunity to get in a workout before starting my day. and it is also where I enjoyed eating dinner Saturday night. I just could not get enough sunshine. Sunday I woke up to more sun shining through our bedroom window, which is so much more pleasant then the alarm clock waking me up. It is truly like instant energy for me. So I flew out of bed, made the coffee, packed the trunk with our lunch, boots, sunscreen and water and we were out the door in about an hour. 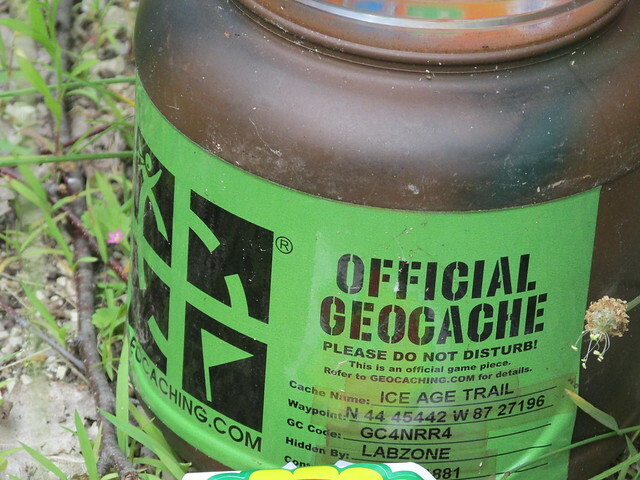 We had a goal to find our #500th geocache. We headed to a trail we started last fall and really wanted to finish it so we could continue on with another trail we had also started last fall. Within a 1/2 mile I felt alive. The sun was bright and the trail was endless in front of us. We saw our first wild flowers of the season along the trail. We logged 21 successful finds and we walked over five miles. Awesome! And the #500th cache happened to be the most painful of all. It was hidden in a bush of buck thorn!!!! I watched from the trail as my hubby ventured in to retrieve it. 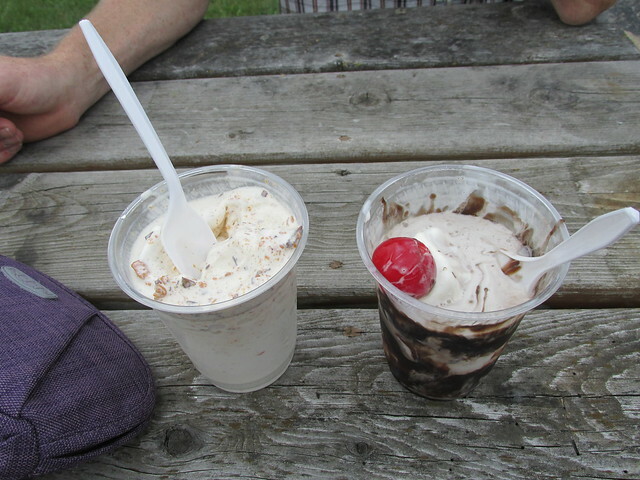 The final stop of our day brought us to a summer time treat. ICE CREAM!!! After all, it was Mother’s Day, I think I earned an ice cream treat. My Mother’s Day ended with a homemade chicken dinner my husband prepared in our rotisserie, baked potatoes, stuffing and side salads. And the best part was….I didn’t have to prepare or clean up a single thing.